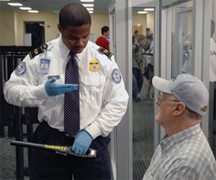 A TSA Officer screening a passenger. The "cost" of travel includes more than cash. Inconvenience, hassle, and time away from home are also factors that tempt us to avoid travel. But these annoyances are exactly the source of the value of the gesture of respect that travel implies. Photo courtesy U.S. Transportation Security Administration. Here's a question. Let's say you manage a dispersed team, and it becomes necessary to terminate someone at a remote site. It's not a RIF — perhaps the issue is performance, or something even more difficult. And let's say that traveling there probably would be a two-night stay, because of the flight schedules and time required "on the ground." You're tempted to do it by phone, or videoconference, or something not involving travel. Is that OK? It's probably not OK. Actually making the trip is better for the employee, better for the company, and probably better for you. The temptation to find an "easier" way comes about because we don't usually have budget to cover such travel. But the root of the problem isn't a shortage of money. If you suddenly found an error in projected materials prices, you'd find the money somewhere, right? Rather, the root of the problem is a mistake in setting priorities. When the budget was first approved, someone failed to allocate for the cost of distant terminations. Now, facing unplanned expenditure, that error isn't seen as important enough to put right. Choosing to find a more "cost effective" method of termination only makes it possible for the company to continue to act irresponsibly. By taking responsibility for this problem now, and by refusing to export the penalties for the error onto the person terminated, we help the company to mend its ways. setting prioritieswe do decide to travel to carry out the termination, we might be tempted to do it on the cheap. For tricky and possibly hostile terminations, it's common to have an HR representative "sit in," but for remote terminations, we sometimes don't take HR with us, to save money. Foolishness. If anything, it's more important to have HR present for a remote termination. The most important reason to travel is respect. How would you feel if you were terminated by phone, fax, or carrier pigeon? Not good, I suspect. The effect on other staff is also important. Everyone is watching. If you do it remotely, some bystanders might feel disrespected, too. Some might start looking for alternative positions, while others might become demotivated. It's a lot cheaper to buy the airplane ticket than to replace people you didn't want to lose. Would you like to see your comments posted here? rbrenlyQztdkTCDdEWejWner@ChacjXcemjPNgQhrOQjkoCanyon.comSend me your comments by email, or by Web form. See also Ethics at Work, Conflict Management and Virtual and Global Teams for more related articles. I offer email and telephone coaching at both corporate and individual rates. Contact Rick for details at rbrenCFUiNbtdLeTvYKsJner@ChacXBgoQcfqGBBDyzaNoCanyon.com or (650) 787-6475, or toll-free in the continental US at (866) 378-5470.